For a warrior going into battle, armor is very important. And not just armor on the head and chest, but also armor on the arms and legs, too. And these Economy Steel Leg Guards are gleaming protectors that are designed to help keep you safe and fighting. 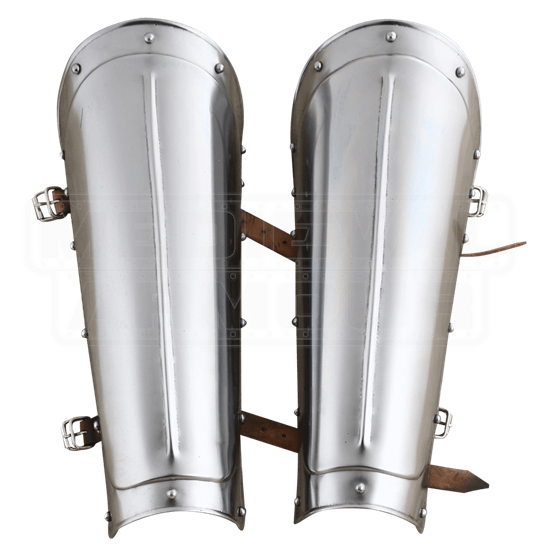 These greaves are made entirely from 18 gauge mild steel and have a polished finish. With an appealing look and a strong design, they offer superior protection and appeal. A central ridge, down the leg guards central plate, adds greater defense to the armor as well. The greaves have a rounded top and rolled edges, for comfortable wearing, and feature leather straps and buckles on the back edges, for an adjustable fit. Possessed if not only an attractive look but also a strong design, these Economy Steel Leg Guards are a warriors choice when it comes to leg protection that not only looks good and offers great protection, but also comes a bargain cost, too!